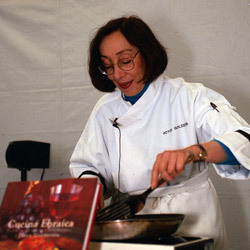 Chef Joyce Goldstein, pcitured below at a cooking demo in 1993, has been supporting the Ferry Plaza Farmers Market since the very beginning. When the market formed in 1993, people were worried that no one would come to shop, but people came. There was a spirit of excitement because the freeway in front of the Ferry Building had come down and people could see the connection to the Bay. They could also come to meet the farmers. My restaurant, Square One, was right near there. Very often, Jennifer Millar, our pastry chef, and I would walk over to the market to get berries for dessert. It was a lot more casual than it is now. In the beginning, a lot of chefs didn’t take the time to come down there, but today we have so many more restaurants promoting farm-to-table, so the chefs have bonded with the farmers. The market is an inspiration for them. Chefs from the East Coast who visit are impressed by what’s being grown, and it gives them ideas for what to request of their farmers back home—so the market’s network is broader than just local. I’m not in the restaurant business anymore, so coming to the market is a lovely way to stay in touch with the chefs. It gives me ideas for my column at the San Francisco Chronicle. I still shop at the Saturday market, usually between 7:30 and 9:00, and there’s a group of people I see every week. I’ve been bringing my grandkids to that market since they were little. They would love to decide whose peaches or berries we would buy. I’d say, “I want you to taste every one and come back and tell me which ones you want.” The whole family participated. For me, coming to the market means getting the best produce, freshly picked. It means my family is eating really well this weekend. And it means I get to see and bond with some of the people who grow our food.